Thanks to smartphones and tablets, the average adult spends more than 20 hours per week with digital media (source: Ofcom). Additionally, Google receives over four million search queries per minute. 1,388 blog posts are published. All in this one minute (source: MarketingProfs). Learning how to create effective content is the first step toward growing your brand’s awareness and building trust and credibility with a desired audience. This foundational knowledge is covered in HubSpot Academy’s free content marketing certification. But that’s just the tip of the iceberg when it comes to developing a successful content process. Content marketers are constantly battling for the attention of their prospects and customers. But with all this content being published, search engines like Google are being forced to better organize and showcase highly relevant content. This led to Google releasing a zoo of updates over the years. The first notable update, which really shook things up, was Google’s “Hummingbird” algorithm update in 2013. This update focused on parsing out phrases rather than focusing on specific search queries. Many search-engine optimizers and content marketers viewed this as an initial shift from a keyword-to-topic focus to content creation and website organization. The next major update to a topics over keyword shift happened in 2015 with Google’s RankBrain algorithm update. RankBrain is Google’s machine-learning artificial intelligence system that interprets the searches that people submit to find pages that might not have the exact words they searched for. Google’s able to do this by associating past search history with similar themes and pulls through keywords and phrases to put together a better context-driven search engine results page (SERP). With all this change comes opportunity for content marketers to be found and, more importantly, found by the right audience. That’s a key facet to creating successful content in today’s online environment. Most people forget this – it’s not just about creating content for the machine (aka search engines). Machines aren’t the ones filling out your forms on your website. Machines aren’t the ones sharing your content on social media. Machines aren’t your customers, humans are. If you really want to create effective content that converts visitors into leads and eventually customers, you need to create a helpful, positive user experience that solves for both the searcher and the search engine; not just one or the other. Your content can solve for the human and the machine by linking together targeted owned media topic clusters (i.e. content you control such as blogs and social media posts) that cover a specific core topic in depth to a centralized resource hub, known as a content pillar. 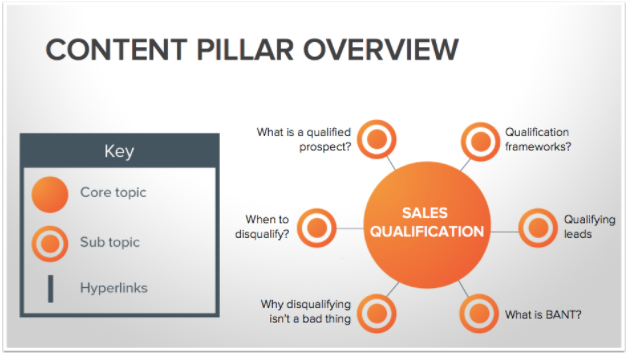 A content pillar is first formed with a core topic, something that’s broad enough that you can really dig deep into, like sales qualification. It’s important to note that the core topic will take the shape of the content pillar, which we’ll review more below. Once you define a core topic, you’ll want to identify a series of sub topics. Sub topics are content ideas that are strong enough to stand on their own (i.e. blog post, video, etc.) but have a common connection with the core topic and can be clustered together with other sub topic content to help tell its story. 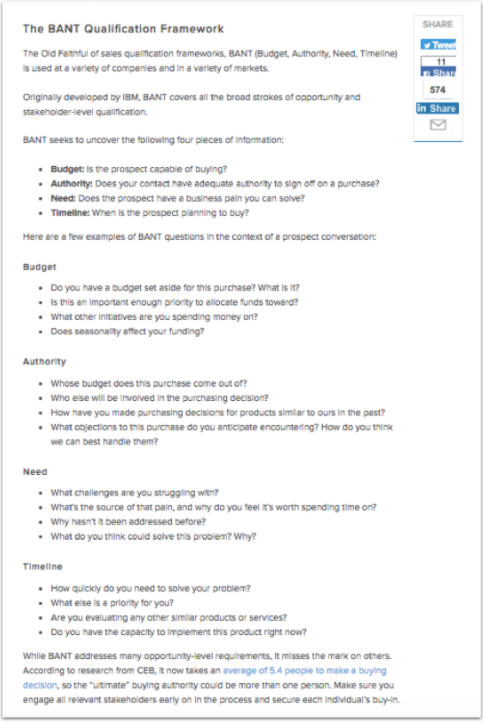 For instance, if someone was interested in learning the BANT framework, a popular sales framework, it’s likely they’re going to be interested in sales qualification. The more sub topics you have that support the core topic and are connected to it via hyperlinks, the better, as you strengthen the value of your topic cluster. And lastly, but most importantly, you have to connect everything together through a series of hyperlinks to and from the sub topic pages to the core topic page. Connecting everything not only provides a positive experience for the human, as they’re easily able to find the similar-themed content they’re looking for, but also, and more importantly, it’s extremely valuable from a search engine perspective. 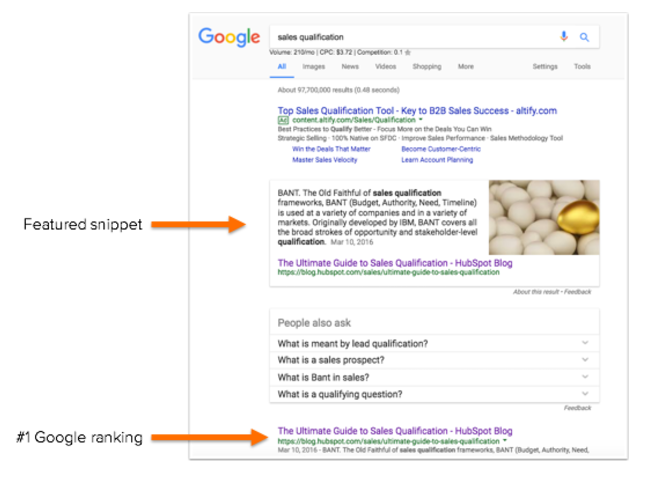 Search engine bots crawl through content like a human reads it, and it’ll see how all these liked-themed pages on this specific topic are associated and connect to one central source – your content pillar page about sales qualification. If you didn’t connect everything, it wouldn’t solve for the human, as there’s no helpful next step to continue binging content, and it won’t solve for the machine, as they wouldn’t be able to easily connect all of this like-themed content together. 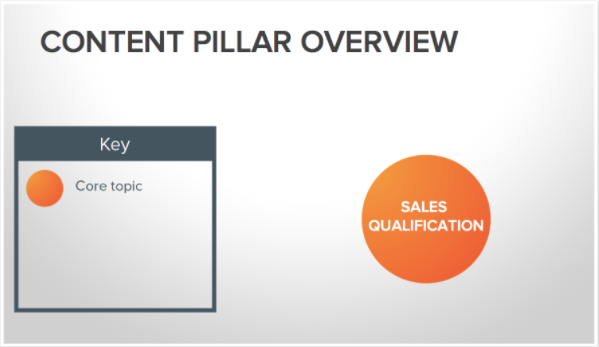 Something important to note, even though the sales qualification content pillar is limited to specific sub topics covered on its page, there are over 100+ piece of content that link to it. It’s important to add a link to all sub topic content that’s relevant to sales qualification, even if it’s not discussed on the page. 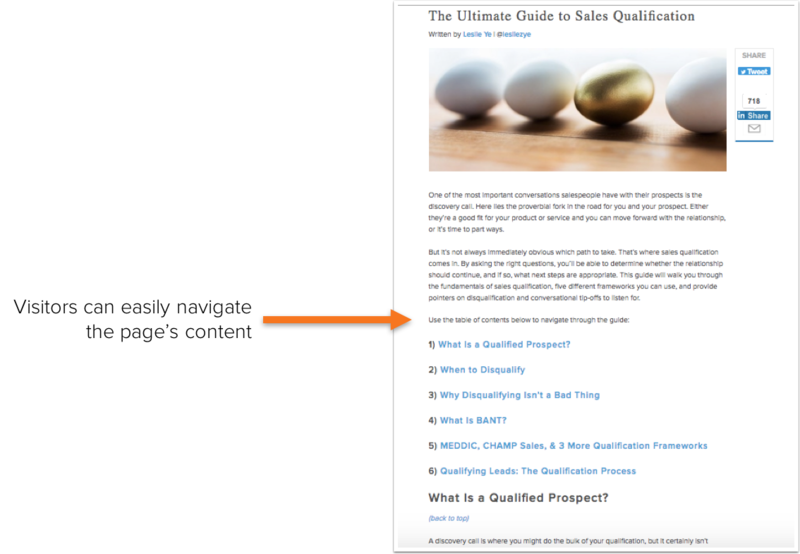 This page is an article on HubSpot’s blog, and it’s one with a lot of rich, valuable text that covers various facets of sales qualification in depth. This page offers a lot of content and breaks it up into sections with an anchor-linked table of contents. This way visitors can easily navigate the page’s content without having to scroll endlessly. And as you read through the content you see another link. 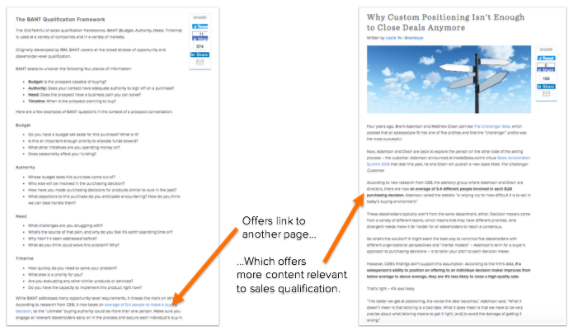 When clicked, it takes you to another page that’s relevant to sales qualification. So how does the sales qualification fair from a traffic standpoint? It receives over 1,500 organic website visits per month coming from search engines. Let’s review how a topic cluster approach to creating a content pillar redefined a company’s content strategy. Townsend Security is a full-service software security provider. Townsend has been creating content consistently for many years, and they’ve seen success (see below). However, you’ll notice there was some turmoil in 2016. At the beginning of the year, Townsend saw a 27% increase in organic traffic. But all that changed in April. Competition for their narrow band of keywords dramatically increased as new competitors entered the marketplace and their larger rivals outspent them on paid media efforts. After a successful start to the year, Townsend’s organic traffic decreased by 38% over the next three months (with a 28% decrease in one month). 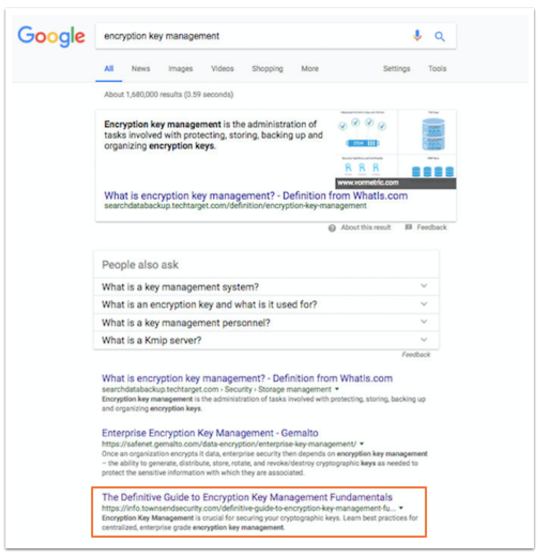 In an effort to take back impression share from their competition and earn back trust from search engines, Townsend decided to shift from writing content around specific keywords and go all-in on becoming the definitive source for the broad term, encryption key management. Learn more about how Townsend created and promoted their content pillar. Townsend’s content pillar is a little different, as they offer the content on the page as a downloadable PDF. This way, visitors who find the content valuable can decide to download the content and take it with them if they choose to do so. Ungating or giving away content can make content marketers uneasy, mainly because they’re afraid of cannibalizing their lead generation efforts. But before we dive into conversion rate, how did Townsend’s content pillar perform from a search engine impact perspective? At this point, Townsend is jumping for joy because they ultimately reached their search engine traffic and visibility goal. Not only did they recoup their lost traffic, but March 2017 accounted for the top-performing month for organic traffic coming from search engines. Now this is how their content pillar solved for the machine. But how did it solve for the human? 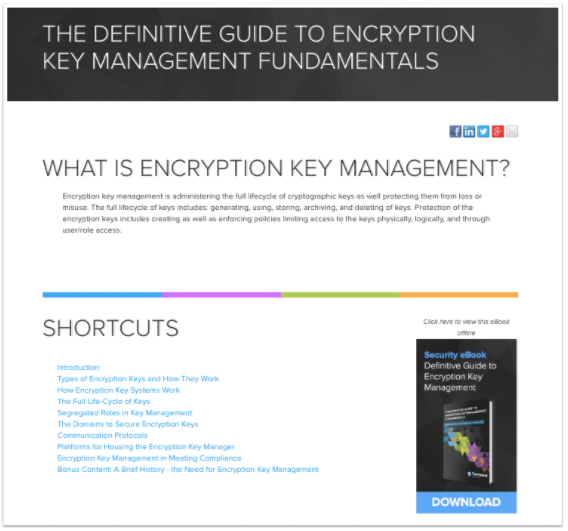 63% of people who visited the encryption key management page decided to download it and take it with them. Now I understand ungating content, essentially giving it away without having to give your information, can make content marketers uneasy, as they think it’ll hinder their lead generation efforts. While I don’t want to discredit that and say that all content should be ungated, Barnes and Noble isn’t afraid of letting visitors come into their store and peruse through their books before buying them. That’s because when someone finds a book they like, content they find valuable, they’re going to take it with them out of the store so they can enjoy it on their own time. HubSpot did a study and found that 90% of people who view our content prefer to read it from a PDF. It’s all about the packaging. In conclusion, don’t limit yourself by shoving your valuable content behind a form because you’re afraid you’ll cannibalize your lead generation efforts. Focus your energy and intention on being helpful, being human, and providing the best experience for your website visitors. Not only will search engines reward you for your content efforts with traffic, but also, and more importantly, you’ll be on your way to building trust and credibility with those visiting your site, which in turn will source more quality leads for your business. How Do You Create a Content Pillar? Earlier this year, I hosted a content creation experiment to better understand marketers’ content strategy pitfalls. Through this experience, I identified a step-by-step process on how to build valuable content pillars from the ground up. 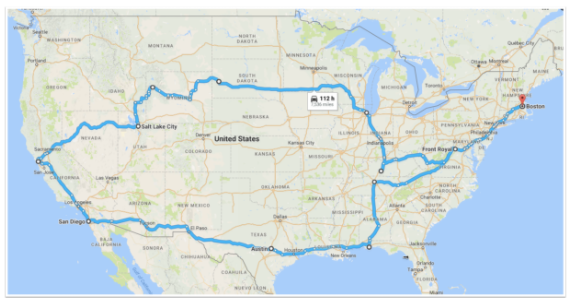 I’m currently on a 7,500+ roadtrip across America with my wife, Ariele, in our Airstream and DIY truck camper (which has a pillar page of its own – and doubled our website’s organic traffic in less than five months). My goal is to educate and inspire people to create more effective content. Through my travels, I’m determined to continue growing and advancing this training content. That means more researching and testing as well as meeting with other marketers along the travel route to learn more about their experiences: what works, what doesn’t, and why when it comes to designing an effective content strategy. All of this knowledge and content will go into my 3.5-hour transformation training at this year’s INBOUND conference. My goal is to provide a comprehensive overview of how to plan, create, promote, and grow effective content through a pillar content approach. If you’re someone who creates or manages content, this training is definitely for you. Learn more about my INBOUND Training Day session: Creating a Content Strategy Framework. Justin Champion is dedicated to helping businesses effectively tell their brand story and is currently the Content Professor for the HubSpot Academy. 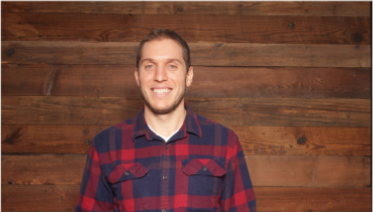 Justin has 7+ years experience in the field of digital media and has helped companies such as Wrangler Jeans, Majestic Athletic, Pendleton Whisky, and Rock and Roll Marathon Series grow their businesses through storytelling. He brings his experience and curiosity to help solve customer content marketing needs both online and offline.